Who is a kaniṣṭha-adhikārī, a madhyama-adhikārī and an uttama-adhikārī ? This is the second last blog in the series of last few blogs on Vaishanava etiquette and Vaishanava Apradha. We will read about three categories of devotees and what Srila Bhaktivinoda Thakura has to say on Vaishnava Apradha. Srila Bhaktivinoda Thakura writes in `Vaisnava Ninda’ (Sajjan Toshani, 1893) that If we neglect to show respect to the ordinary jivas, special honour to the religious jiva, and proper respect to brahmana-jivas and vaisnava-praya-jivas, then we invite sin upon ourselves. 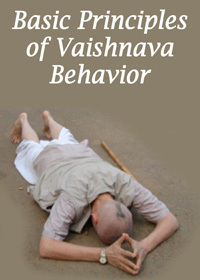 But to show disrespect or dishonour to a vaisnava-jiva is an aparadha. Performing ordinary penances can erase so many sins, but an aparadha is not dispelled so easily. Sins influence the gross and subtle bodies. Aparadha specifically affects the jiva’s very soul and causes him to fall down. Thus, whoever wishes to perform bhajana of the Lord must guard against committing aparadha. One should mentally honor the devotee who chants the holy name of Lord Kṛṣṇa, one should offer humble obeisances to the devotee who has undergone spiritual initiation [dīkṣā] and is engaged in worshiping the Deity, and one should associate with and faithfully serve that pure devotee who is advanced in undeviated devotional service and whose heart is completely devoid of the propensity to criticize others. The kaniṣṭha-adhikārī is a neophyte who has received the hari-nāma initiation from the spiritual master and is trying to chant the holy name of Kṛṣṇa. One should respect such a person within his mind as a kaniṣṭha Vaiṣṇava. A madhyama-adhikārī has received spiritual initiation from the spiritual master and has been fully engaged by him in the transcendental loving service of the Lord. The madhyama-adhikārī should be considered to be situated midway in devotional service. The uttama-adhikārī, or highest devotee, is one who is very advanced in devotional service. An uttama-adhikārī is not interested in blaspheming others, his heart is completely clean, and he has attained the realized state of unalloyed Kṛṣṇa consciousness. The following year, the inhabitants of Kulīna-grāma again asked the Lord the same question. Hearing this question, Śrī Caitanya Mahāprabhu again taught them about the different types of Vaiṣṇavas. In this way, Śrī Caitanya Mahāprabhu taught the distinctions between different types of Vaiṣṇavas — the Vaiṣṇava, Vaiṣṇavatara and Vaiṣṇavatama. He thus successively explained all the symptoms of a Vaiṣṇava to the inhabitants of Kulīna-grāma. So according to the above instructions of Mahaprabhu, simply by chanting Hare Krishna mantra, one attains the platform of a Vaisnava ! Apart from well-intended discussions of those faults that may arise accidentally, one is liable to commit the offense of criticising a Vaisnava. The fundamental point here is that slandering and blaspheming a Vaisnava..leads to namaparadha, and if one commits namaparadha, then divine revelation (sphurti) of the Holy Name will never manifest. 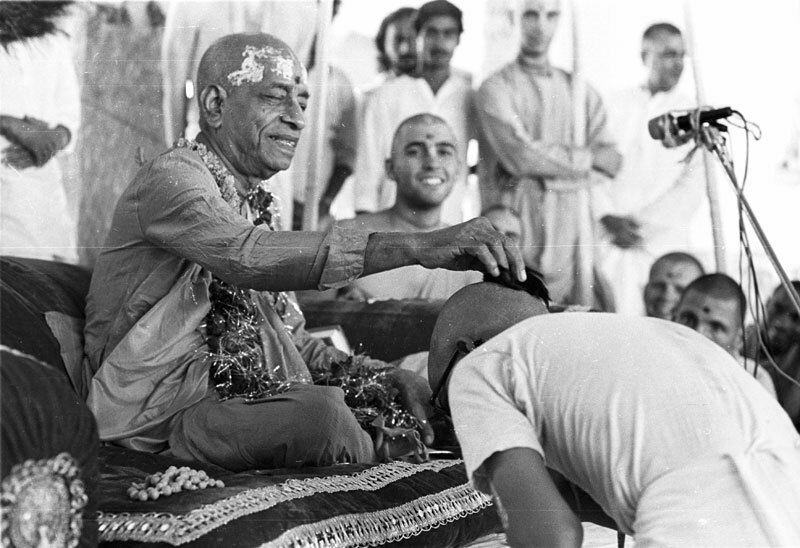 One cannot become a Vaisnava without such revelation of the Holy Name. O readers! You must think carefully upon this serious subject matter. According to proper devotional conclusions, you must show honor to true Vaisnavas and without any hesitation whatsoever, abandon the company of non-devotees. If one blasphemes a genuine Vaisnava, then the transcendental truth concerning the Holy Name (nama-tattva) will never manifest within one’s heart. So this is the punishment we receive if we blaspheme other devotees, the Holy Name withdraws the taste from us! We can clearly see from the above that anyone who chants Krishna’s name is to be considered a vaisnava and he/she is worshipable. We also understood what are the serious consequences of criticism of a devotee on our bhajan and spiritual journey. Please pardon any errors in the blog as I do not have too much realisations on this deep topic but I still felt inspired to share the same with devotees. In the next blog, the final one in this series, we will find out what is the cause of Vaishnava Apradha? And how to avoid it! Some weeks back, in an emotional state of mind, I, foolishly, sent the below SMS to Guru Maharaj. Reading it today I feel quite embarrassed at my childish attempt to use humour to drive home a simple point that inspite of my long list of disqualification, I am receiving a whole lot of unproportionally large volume of Love from so many channels around me. As I take some baby steps in my spiritual journey, I find myself falling in love with an increasing number of devotees. And strangely, I observe that more the number of devotees I fall in love with, the more my love for Krishna increases automatically. When I make space for one more devotee in my heart, the heart acts on its own to make more space for Krishna and vice versa. Somehow the same very heart which could hardly accommodate only a few persons from family and friends circle ( looking back I think it only had one person in it, myself), now it seems be be getting bigger and bigger to make room for a large number of devotees, the quality of bonding and the intensity too has increased many times than what I ever increased in my material life. In the past there was always a conscious and subconscious `give and take’ feeling, even with close friends. In fact the closer a person the higher used to be my expectations from him. Now, with devotees just the reverse is true. I don’t have any expectations from most of them and the only thing I long is to be in their association and, if possible, they speak about Krishna, but most of the time I am in a blissful state by just being near them. Being a very introvert and dry person my list is still quite short and many a times the love is just one sided as the other devotee does not now how much love and respect I have for him. I wish I could name all but to name a few HH Gopala Krishna Goswami Maharaj, HG Rukmini Krishna Prabhu, HH Sacinanadan Maharaj, HG Karuna Prabhuji, Subir Prabhu, my dear friend Shyamsundar Prabhuji, HG Prasanto Mataji (what I would not give to have her as my mother), HH Giriraj Maharaj, HH Radha Govind Maharaj, HH Bhakti Vijnana Maharaj ( without even meeting Maharaj I feel so much connected to him), HG Radheshyam Prabhuji. I have fallen head over heels over HH Bhakti Charu Maharaj. And then all previous acharays, six Goswamis, Chaitanya Mahaprabhu, Lord Nityanand, Sri Mayapur Dham, Srila Bhaktivinoda Thakura, Lord Balram and Sri Radha & Krishna and Their associates, Tulasi Maharani ( another case of head over heels), ISKCON Punjabi Bagh temple, in fact all ISKCON temples, Vrindavan Deities, Damodar Lila, Govardhan Lila, Bhagavad Gita, Vaishnava bhajans, MVT, deep soulful kirtans, ISKCON, preaching,….. the list gets longer by each passing month. Three special names I would like to mention in the end are hearing Krishna katha (how I wish if somehow I could dedicate my one ear 24 hours a day plugged in listening it), Śrī Caitanya-caritāmṛta (completely and madly head over heels) and Srila Prabhupada. 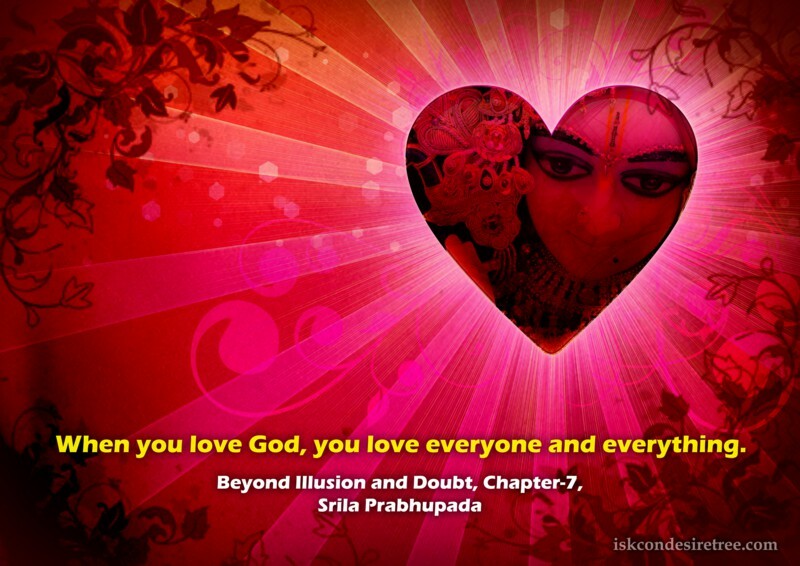 I don’t know how and when my respect for Srila Prabhupada turned into love. It has primarily happened due to the causeless mercy of Guru Maharaj. I fell in love with Śrī Caitanya-caritāmṛta after hearing it the first time itself, while not even knowing who is Chaitanya Mahaprabhu! I still remember that it was during my initial days at Punjabi Bagh temple, speaker was HG Swargapati Prabhuji. What he was reading and reciting was beyond any definition of sweetness known to me before. After prabhuji’s lecture got over I collected some courage and approached him and asked from which book he was reading these verses. Prabhuji replied me he was reading from Śrī Caitanya-caritāmṛta. I immediately went to the book store and asked for it. The Prabhuji in charge of the store Looked at me from head to toe and then politely advised me to buy the condensed version first. I brought it home and after few days I went to Sri Vrindavan Dhama, checked into the guest for the first time and finished more than quarter of the book, but somehow I never completed it. Then few months back after hearing `Rupa Siksha’ lecture recording by HH Radha Govind Maharaj I felt inspired to read it and from that day onwards I read a few verses almost daily. I love all three from the core of my heart. I am copying the song `Thakura Vaisnava Pada by Srila Narottama Das Thakura below. Although I still remain judgmental about devotees and do not have any such feeling in my heart yet I pray to our guru parampara to kindly bless me that one day such feelings about devotees can blossom in my dry, and stone like hard, heart. I beg devotees to kindly share their experience on falling in love with devotees.